Get Rid of that Plastic Guilt! Hip, Hip, Hurray I found organic reusable vegetable bags today. Ran across this wonderful shop called wonderthunder, on Etsy and had to share. I love my farmers market, but I get such guilt when the farmer asks if I want a plastic bag for my newly in season cherries. Solution! These great organic cotton muslin bags keep you looking fabulous while you shop and save the environment too! 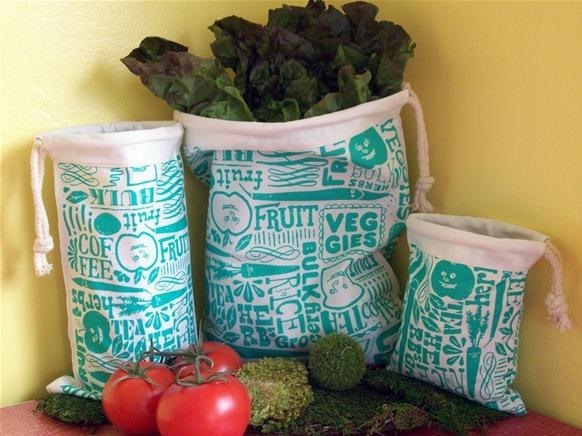 Each bag features screen-printed smiling fruits and vegetables on both sides. They come in a range of colors (red, green, blue) and will entertain you and the people around you, as you shop! Not only that, but you can even keep your vegetables in the bags as you stash them fridge! Click here to buy a set of your own for only $20 or you can buy the bags individually in each of the different sizes. Now go fill up your delightfuly adorable bags with fruits and vegetables galore at your farmers markets and be plastic guilt free! Happy Shopping, Happy Eating! these are probably way better in keeping veggies fresh and letting them breathe! And super cute too! Plus we get to help the small vendors who make these bags! My pleasure amie!